to see if we can bring some clarity and best practices to the discussion. What is an Inventory Assembly (sometimes just called assembly)? This is an “Item” in QuickBooks like any other item. The distinction is it will have a Bill of Material (BOM) attached to it. A Bill of Material is simply a listing of all components that will be used to create/produce/assemble the final Inventory Assembly item. Bill of Materials does not have to contain only inventory parts (although they can). BOMs can contain labor, other assemblies (many times called sub-assemblies) and a variety of other components. It’s important to point out that Group Items cannot be included in a Bill of Material. Below you can see an Inventory Assembly item with all of the normal fields for general ledger accounts etc. The difference is you see a partial Bill of Materials window showing component parts, item type, quantity and total cost for each line item and the total cost for the Bill of Material. The accounting behind this particular build would be as follows assuming you build just one assembly item. You would be crediting raw materials for the cost of the build and debiting the cost of the finished product. From a Balance Sheet standpoint, nothing has really changed since we’re just swapping dollars from one bucket and putting them in another. If you only have two or three line items you can see them all in the partial view of the Inventory Assembly item master window. However, if you would like to see the entire Bill of Material you merely click on the “Full View” button and the entire Bill of Material will be displayed. When you Build an Assembly (sometimes called production) QuickBooks gives you valuable information prior to executing the Build itself. Below we point out just a few of the items. In the Assembly Item Info area, you’ll see Quantity on Hand, on Sales Orders and Quantities already reserved for Other Assemblies. The result is you can see the Quantity Available. In the bottom right of this window, you can see the Maximum number you can build based on component quantities required for this build. Very valuable. Assemblies are only available in QuickBooks Premier and QuickBooks Enterprise. They are not available in QuickBooks Pro. One excellent feature available only in Enterprise Solutions is the ability to change the Bill of Materials on the fly when completing a build. You can change an item, delete it, add a new item, change the quantity etc. In the not too distant past, you had to change the Bill of Material whenever there was the slightest change. Not anymore. Nice job Intuit. 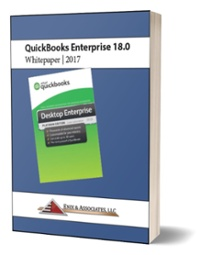 In some cases, QuickBooks Enterprise may not give you the functionality, flexibility and/or reporting capabilities you need. If this is indeed the case, there are three products that we are familiar with that we know work well depending on your specific requirements. Fishbowl Inventory: Creates Bill of Materials and can track more parts that QuickBooks. It has a pick, pack and ship warehouse function, can track by warehouse and integrates with multiple e-commerce products. Acctivate: Similar to Fishbowl. This inventory management software is available as a cloud-based solution or in-house. MiSys Manufacturing Software: Probably the most advanced of the three, MiSys includes the following: Custom Reporting, Shop Floor Control, Advanced Production & Purchasing, Material Requirements Planning, Bin Tracking, Bar Coding, and Serial & Lot Tracking. Everything you need to know in 69 informative pages. Why Choose QuickBooks Desktop Enterprise? A multi-national award winning Intuit Premier Reseller and 3-time named Top 100 ProAdvisor serving Tampa & Orlando, Florida. Specializing in QuickBooks Point of Sale, QuickBooks Pro & Premier, Enterprise Solutions and QuickBooks Online. © 2019 Enix & Associates, LLC | Website: Precision Pages Inc.